Pdf joiner and splitter software combine multiple pdf files together and split large pdf files into multiple parts. 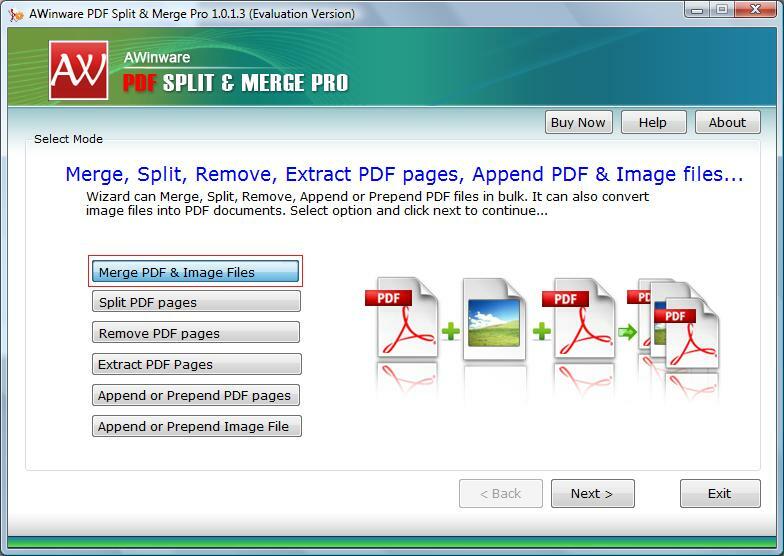 Pdf split merge professional edition is devised to perform pdf page editing for pdf joining, splitting, cutting, and extracting pages. This easy to use application supports merging of pdf as well as image files together to create a single combined pdf. Thus anyone can also use this program to convert photo files into pdf format. Pdf joiner splitter tool is compatible with all popular image formats including JPG, GIF, PNG, BMP and TIFF for merging into pdf. It is very cumbersome to task to share large pdf file online, so pdf split merge pro helps to burst pages into multiple parts. Pdf page extractor software is Windows based utility, extract part page range from pdf and create a new pdf. If you are in need to append or prepend another pdf file into exiting documents, this awesome utility performs this task in a professional manner. 1. Program combines pdf and image together. 2. Tool is compatible with all Windows based OS. 3. Add, split, extract and remove pdf pages using single application. 4. Program is easy to use even by novice users. 5. Tool contains inbuilt help manual.